The only school in the village is Ropley (C of E) Primary School. It was founded in 1826 by the Rev. Samuel Maddock, vicar at the time, with William Faichen as teacher in charge. The original building on Petersfield Road was replaced by a new building on Church Street in 1869. Enlarged and modernised in 1960, it expanded from 1970 onwards, and became increasingly involved in village life, with links being forged between the church and the school. The school badge was designed in 1977 by Mr Tony Gilliam. Further building took place during the 1990’s. Projects included two new infant classrooms to replace the temporary classrooms, new entrance and admin facilities, double glazing of 1960’s classrooms and re-tiling the Victorian roof. 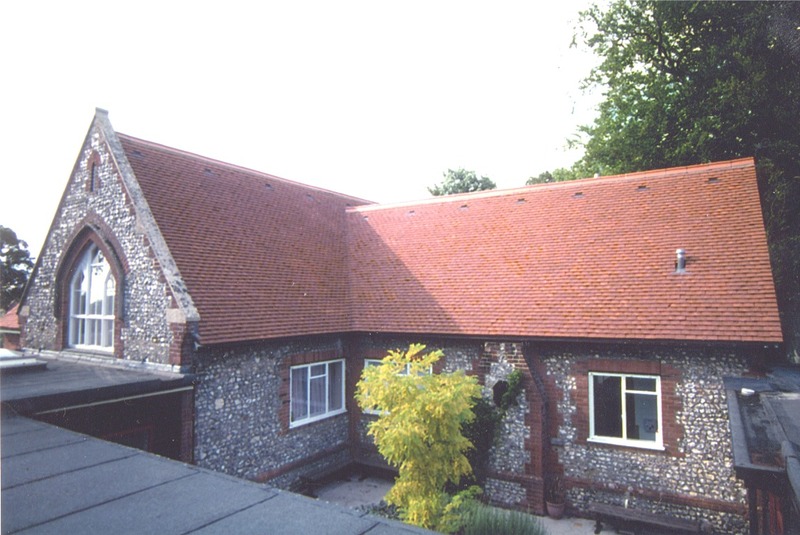 In 1997 the grounds were extensively landscaped and a sixth classroom added. The school presently has 163 pupils. Of the 125 children 5-10 years old identified in the questionnaire and eligible to attend, two thirds are being educated at the Ropley school. The survey showed that there were 88 children between 0 and 4 years which would indicate that the school should be able to meet the apparent needs of the village for the next 5 years, assuming that one third continue to be educated outside Ropley. The school receives very positive support from parents and families, with a great deal of commitment given by friends and parents groups in raising finance through fairs, jumble sales, and events. Given that it operates in the top quartile of the National Performance Tables it is sad to see that 36% of eligible children in Ropley go to schools outside the village, presumably to private schools. As a result the school’s catchment area is wider than it needs to be, it doesn’t reflect the village as it could do, and children grow up in the village without mixing with their local contemporaries. The school has excellent facilities and allows the local community to hire many of them, but only 31% of the respondents were aware of this policy. In relation to other educational facilities, 39% of the respondents believe that after school clubs were needed. It is worth noting that much of this support also came from people who did not send their children to Ropley school. There was also a high level of support (41%) for a holiday play scheme, in addition to the two week holiday family swimming club run by the school. The highest support was for Adult Education evening classes. 313 (69%) people voted in favour, with computing (44%), keep fit (41%), and languages arts and crafts (both 34%) being the most popular subjects. The most recent Ofsted report gave high marks to the school, saying that the ethos was excellent, with pupils working well and committed to high standards. The pre-school induction is good and valued by new parents and the special educational needs are also good. We hope you will forgive our boldness in writing to you as, though we know all about you, we have never met you. 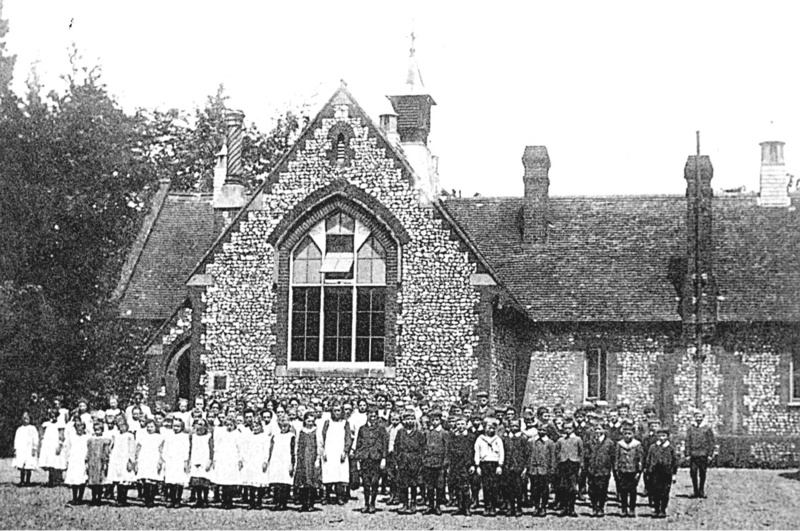 We are pupils at Ropley Church of England controlled Primary School in Church Street, Ropley. You don’t remember it? This is the big school built by Rev. Samuel Maddock in 1869. It replaced the one you and he founded 173 years ago in the thatched cottage along the Petersfield Road. The bell and the plaque from your school hang in our entrance hall next to pictures of your original school so we can imagine what it was like back in 1826. We are writing to you on the first day of the last month of the last year of the twentieth century — 169 years after your sad death. We would like to tell you about our school. It has a big area of land about it. We have room to play netball on the playground as well as hockey, football, cricket and rounders on the field. We have even got a swimming pool built by parents in 1973. Don’t worry — we still play the sort of games your pupils knew like hopscotch, skipping, chasing and of course football. Sometimes we play marbles, conkers and singing games. Last year we even learnt some of the old traditional games! At the front of the school there is a lovely pond where we study wildlife like tadpoles, frogs, dragonflies, insects and plants. You will be pleased to know that the fence around our pond is exactly the same style as the one round your school. We have six classes now but only about 30 children in each class. We wear a school uniform. The colours are brown, blue and gold. Our badge shows a golden wheel because you were a wheelwright and a white cross because Rev. Maddock was the vicar and this is a church school. A lot more people work in the school. We have new offices at the front of the school where our Admin Officer works. She has two computers, a telephone and a fax machine. Our head teacher (a lady by the way!) has her own office. The staff room has 13 chairs. Our school is kept warm by oil fired central heating and we have bright carpets in all the rooms. We are each going to tell you our special view of Ropley. Stacey came from a big town called Guildford. It had high buildings, wide tarmac roads, street lights, traffic lights, brightly lit shops and industrial sites. She loves the winding lanes around Ropley with their thick hedges where small birds and animals hide. She enjoys the open fields where animals graze. Stacey’s family have lots of different pets — the chicks are her favourites. She really likes the kind friends she has at school. Lots of people made her feel welcome when she first arrived so this is her special memory of Ropley. Sam lives on a farm. There are loads of machines like tractors, combine harvesters, fork lifts and buckets. He laughs about the smelly cows and silly sheep. He has even got some pigs. His house is very big. Everyone rides quad bikes which are a bit different from the horses used in your day! Sam and his sister come to school by car. It takes about five minutes. Like most children he has friends to play at his house and goes visiting them. After school he does lots of activities like football, swimming and Cubs. He particularly likes the fact that there are lots of different farms around Ropley. Tessa loves riding, singing and acting. She plays the flute and learns modern tap and ballet dancing. Ropley is special for her because it is in the country but it has lots going on and is a friendly village. She enjoys Brownies and playing with friends. She likes to go for bike rides with her friends to the recreation ground. Martin goes to school on the bus. His best school trips are the week he spent in the Brecon Beacons in Wales, the week at Minstead in the New Forest and going to Beaulieu. He likes using computers at school and he loves technology. Martin is in the top class. Every year on founder’s day his class retell the story of the founding of Ropley School — you remember how you and Rev. Maddock started it in the belfry at Bishop’s Sutton Church? After the service in St Peter’s Church, Ropley, his class go to Bishop’s Sutton to put flowers on your grave. Martin feels that Ropley is not big but there are a lot of things that you need going on around it. It is easy to get to local towns to use their facilities. He finds the agricultural activities interesting. He likes hunting for insects and natural objects in his garden. He really enjoys reading. You would be amazed at all the books in our school library! There is so much more we could tell you about our school. We have whiteboards not black, electronic security systems as well as keys, double glazing instead of leaded lights, outside benches made of recycled plastic bags … but the bell has gone for lunch and it is pizza today! Goodbye and thank you for listening.